September | 2013 | Love Those "Hands at Home"
I Tempted Fate . . .
Are you the superstitious type? Do you believe you can jinx yourself? Like, when you were in high school, and you’d say, “I think I really aced that test,” and then you’d find out you got a 72? Or you’d tell everyone how great the job interview went, and then you’d never hear from the interviewer? You’d think we’d learn never to tempt Fate by making such declarations. I tempted Fate yesterday. And Fate won. I’ve been a candy-making whirlwind. I’ve made about 12 different kinds of chocolate candy in three days. Four kinds of bark. Three kinds of candy bars. Caramels about 4 different ways. Peanut butter meltaways and mint meltaways . . . oh, yes, the mint meltaways. Uh-oh—why did I say that? I wasn’t done making candy yet and Fate heard me. Back to the mint meltaways. I’m always happy when I get an order for mint meltaways because they’re one of my favorites to sample—silky smooth, refreshing, dark chocolate, mint—yum. 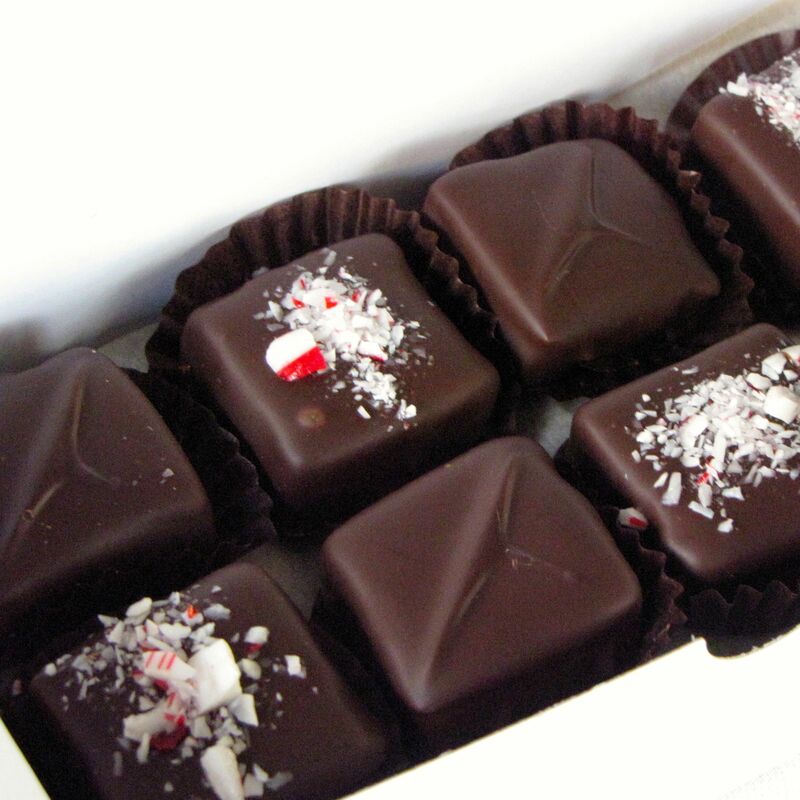 When I make these, I dust the top of half of them with finely crushed peppermint candy. Crushing the candy is the hard part. It involves putting the candy in multiple layers of plastic bags (because when peppermint candy breaks it gets sharp edges that cut through the bags!) and pounding away with a dead blow hammer. I have to pound a long time to get the candy really crushed and the only consolation is that it makes a lot, so it should last me for months of mint meltaways. Except Fate was going to have her way with me. I finally had my bowl of precious peppermint dust in one hand. I was ready to start dipping the meltaway innards in tempered chocolate. I started across the kitchen. A stray breeze caught a piece of waxed paper and blew it off the counter. I lunged to grab it. And my bowl of peppermint dust tipped. And jerked. And spewed dust across the kitchen like an intense mint-scented blizzard. And, although it doesn’t fit my “loving hands at home” image, I swore like a pirate. Like my husband, the former Marine, does when he screws up his counted cross stitch and has to rip out 4 hours worth of work. I swore and watched the peppermint dust settle . . . The swearing helped. And I had no choice but to clean up the mess of sticky dust, which got in every crack of the hardwood floors and wanted to stay. And no choice but to start over and break up more peppermint candy with my dead blow hammer. And that helped, too. Something about banging that hammer onto that candy, imagining Fate’s smug little face there, really, really helped! But don’t tell her I said that! And don’t tell her that I have more candy to make today and that I need it to go well! And be careful, yourself, about tempting Fate—she’s listening. I’ve been making candy pretty much non-stop for the last four days and, as appealing as that might sound, it also means I have been eating a LOT of sweets and was pretty hopped up on sugar. I needed a break. Something healthy to eat, maybe some protein and fruit. A few minutes to sit down before I went back to the kitchen. Ah, just the thing. 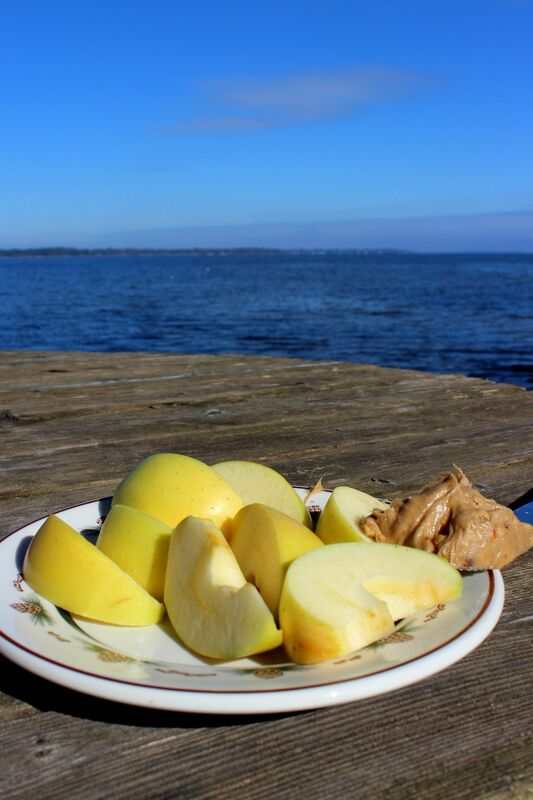 An apple, some crunchy peanut butter, a beautiful lake, a crisp day. By the way, the apple is a “Blondie.” I’d never heard of it before I bought it last week at an orchard here in upstate New York. I found only a little information about it, which compared it to a Gala but yellow. It’s a very nice apple—a beautiful color, quite crispy, good juicy flavor. It’s a little sweeter than I would normally choose but not super-sweet like a Golden Delicious. If you see them, they’re worth a try! Since they’re early apples, you should probably refrigerate them. The human desire to leave an imprint and to decorate a plain surface amazes me. From the cave paintings of Lescaux to the graffiti in today’s cities, we seem impelled to make a lasting mark. Some artists choose a traditional medium and become expert in it. They purchase oil paints and quality brushes or yards of new fabric and state-of-the-art sewing machines. Other artists use what is at hand, finding a canvas in the most unlikely places. One of the oddest of these accidental canvases may be fungus. 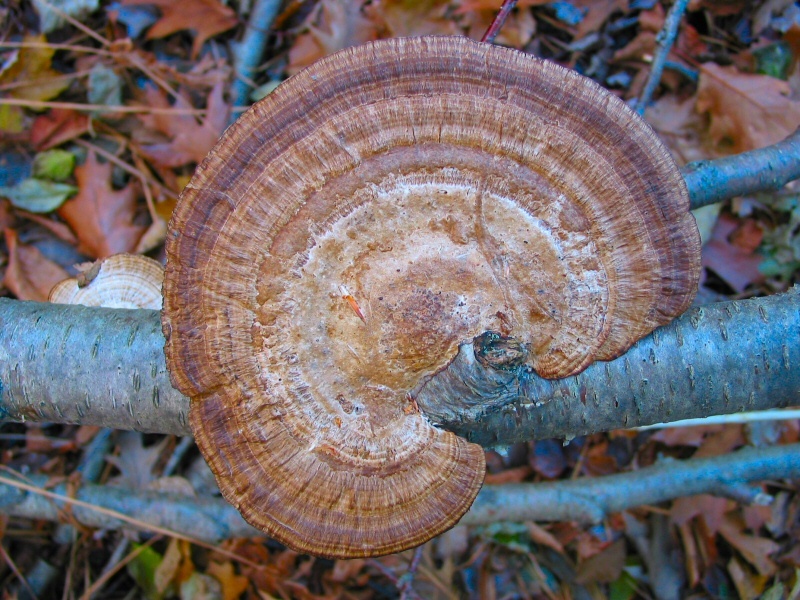 Not just any fungus, like that stuff growing on cheese you forgot in the back of the fridge, but a particular fungus—Ganoderma applanatum, which grows mostly on dead or dying trees. 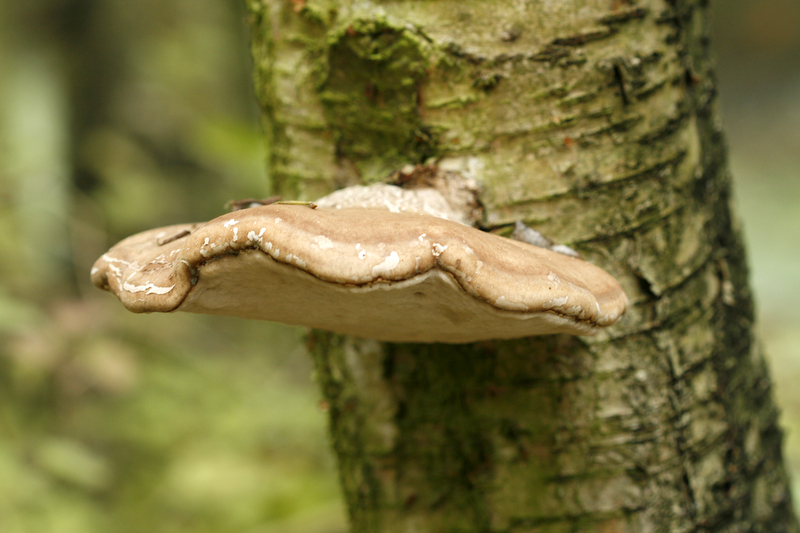 If you’re given to rambling through the woods, you’ve probably seen these fungi, also called Artist’s Bracket or Artist’s Conk, growing on the trees. These aren’t little mushrooms but, rather, the kind of growth that will have you exclaiming, “There’s a humungous fungus among us!”* Indeed, some are very large and they aren’t gummy or gelatinous or icky like you might expect fungus to be; they’re quite hard and woody and often lovely on top, but soft and almost velvety on the bottom, the side that artists use. This soft underbelly of the fungus is easily marked with a toothpick or point of a nail, and the marks turn brown and become permanent. As it dries the fungus becomes wood-like and can be coated with varnish but I don’t think it needs to be. 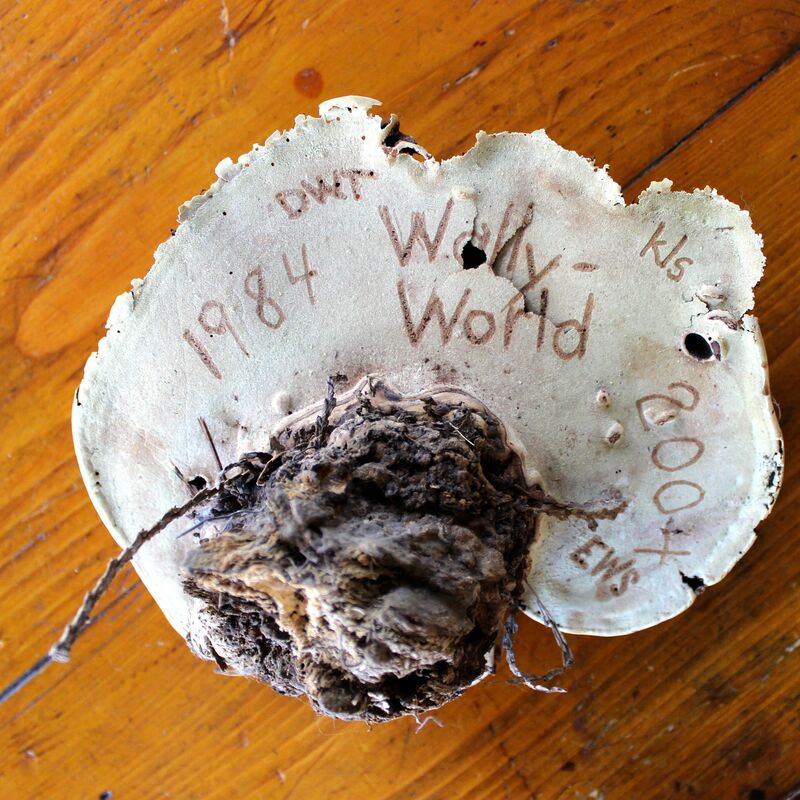 According to Larry Schneider, a fungus artist, on his website, the tradition of making art out of these fungi has been done by American pioneers and Native Americans. He also says that museums have specimens done by soldiers of the Civil War. I couldn’t find any information to corroborate the history of the art form but it makes perfect sense to me that it’s an old form. I think of it as sort of a woodsman’s version of the sailor’s scrimshaw. The white surface becomes a tabula rasa, just inviting a transfiguring mark. Today, artists decorate these fungi the traditional way, by scratching the surface or with a wood-burning tool, or they use oils or acrylic paints. The subject matter is usually, appropriately, rustic and primitive, with images of forest and stream, although I’ve seen examples with ballerinas and sad clowns. The only drawback is that you can’t hang them on the refrigerator! We made this one when we left our beloved lakefront rental, after it was sold. * I got this line from singer/comedian Camille West. For me, a special feeling comes from picking up a project, begun with good intentions by a woman who now can never finish her own work, and seeing it through to completion. I always imagine that long-gone woman smiling, to know that her effort was not wasted and that her work lives on. 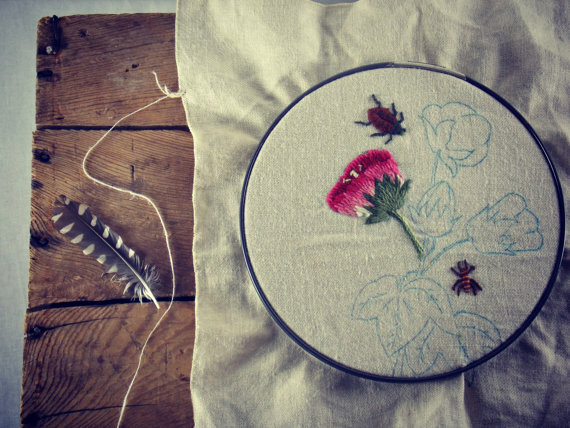 If you love to embroider or quilt AND you love vintage AND you love the sense of a connection across time and place and experience, you can find almost limitless opportunities to work on vintage linens that need attention from you to be completed. It’s the best of all worlds—you can add your touch to the work, feel great about it completing a project that never would’ve gotten done without you, and be further rewarded by a vintage design done with quality vintage fabric! Just as so many of us buy patterns and fabric with big plans but end up, instead, with UFOs (un-finished-objects), our foremothers did, too. Etsy and eBay are crammed with these projects, either never started or only partially done, and all are just waiting for a pair of loving hands to complete them. If this all sounds appealing, you have lots of options to choose among, including the three I’ll cover here. I did a quick search on Etsy just now that yielded over 100 vintage items, ready to be stitched and turned into something lovely. You could find many more on eBay. The projects range from pillowcases to napkins to aprons to towels and the fabrics range from Irish linen to cotton and easy-care-options. Some of these projects are completely unfinished and some are nearly complete. You can even find sets that include the original thread. 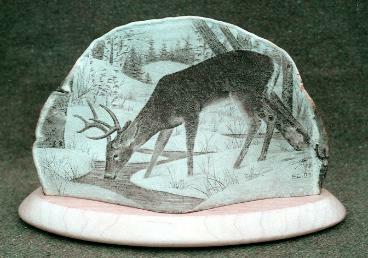 This is an example that I found recently and will list on Etsy if I ever get around to it. The embroidery here is finished and accents the colored cotton. 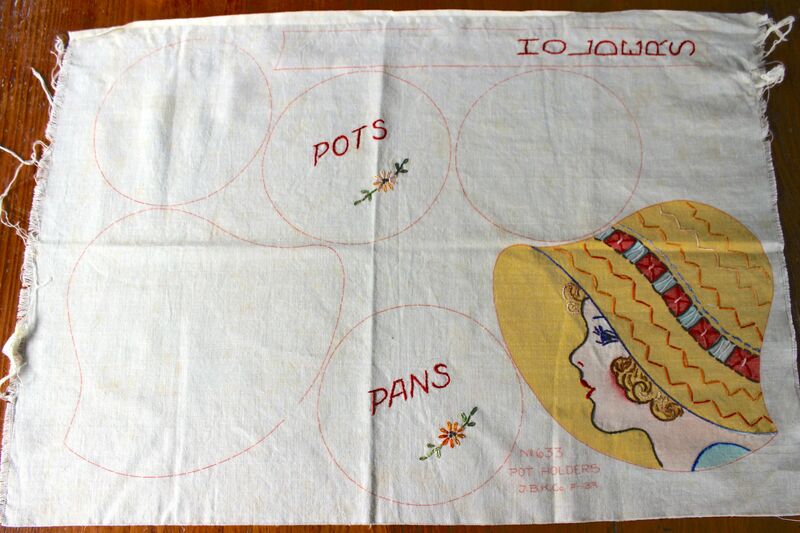 The pieces are designed to be assembled as potholders and I think the girl’s face and bonnet piece is meant to be a caddy for the round potholders. 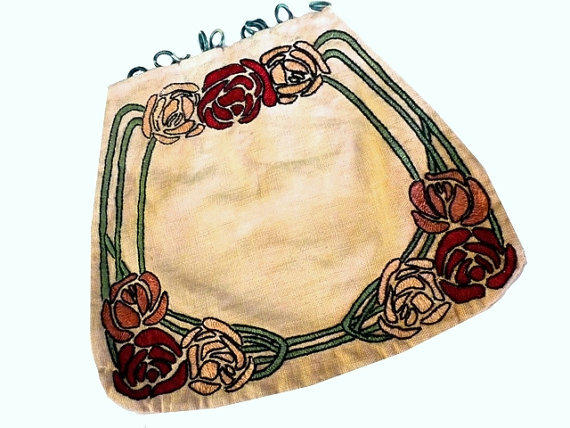 The long piece with the embroidered word “holders” may be meant to be folded in half and stitched to the girl, as a handle that could be put over a drawer pull. I love this Arts and Crafts design; it seems to need only a strap to finish it. 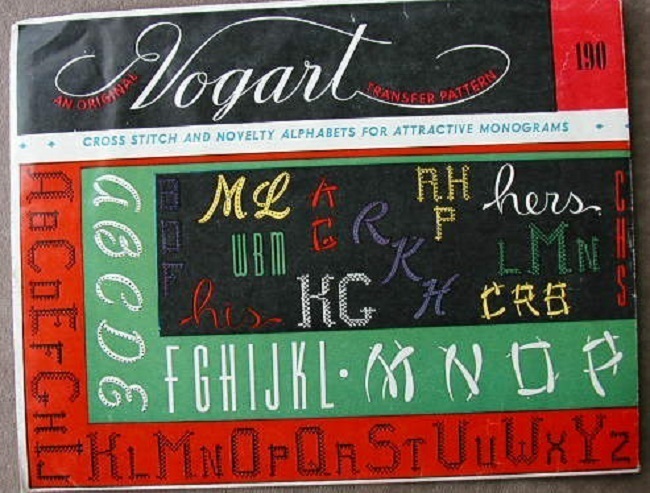 Iron-on transfers were very popular in days gone by and a favorite technique for women to spiff up plain towels or other household items. 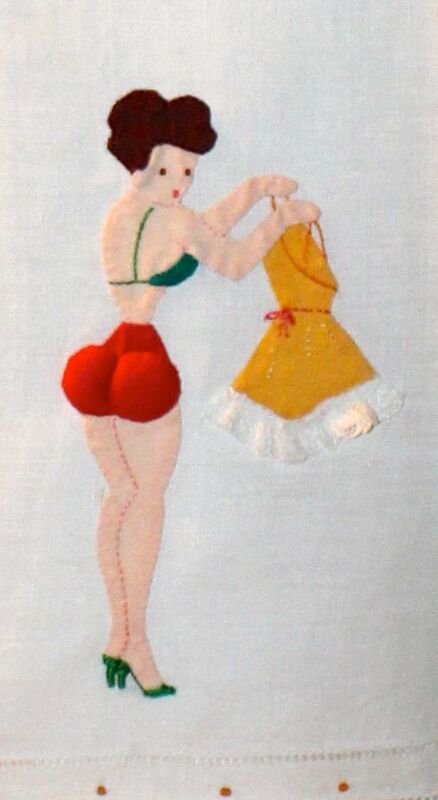 These pieces of tissue paper had a design that could be transferred to fabric with a hot iron and each woman could choose her own design and colors for embroidering. 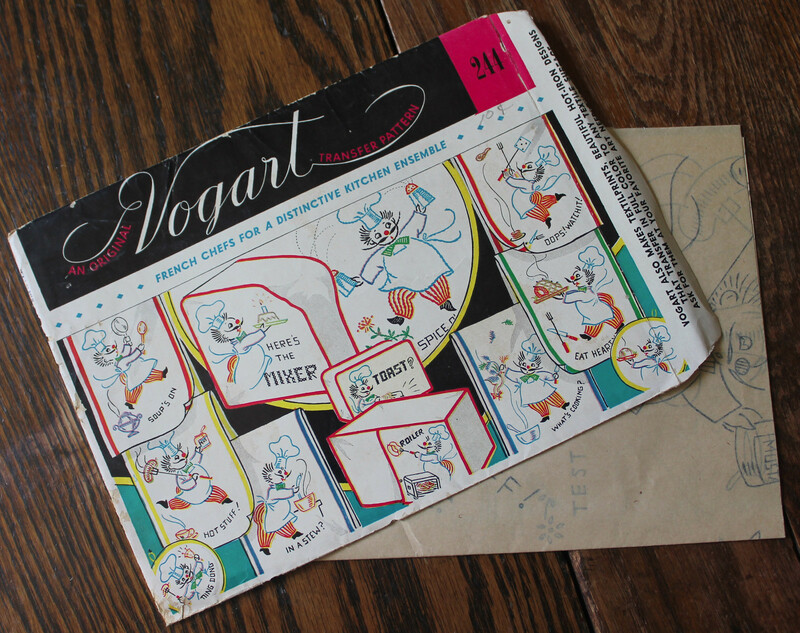 Vogart was a huge purveyor of these designs and there are literally hundreds of sets of Vogart designs available on Etsy and eBay at any given moment. 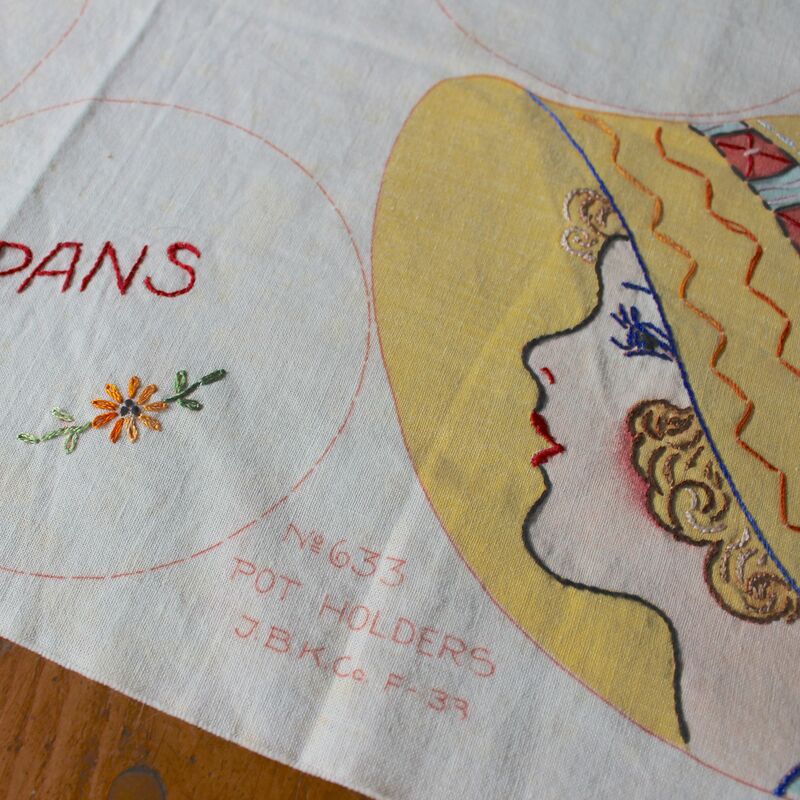 If you are lucky enough to have some vintage towels or pillowcases that belonged to your grandmother or mother, you can replicate the work they may have planned to do by using these transfers and doing the embroidery. And, if you are NOT lucky enough to have plain linens waiting for your loving hands, of course you can purchase those in lots of places, from garage sales to antique stores. And how cute are these chefs? You can even get transfers to create quilt blocks that can then be turned into a full-size quilt, just like one your grandma might’ve made. And speaking of quilts, it nearly kills me to find a beautiful quilt top, pieced or appliquéd by hand, that was never completed and used. All that work! All that love! All that unfinished business . . . I understand how this happens. 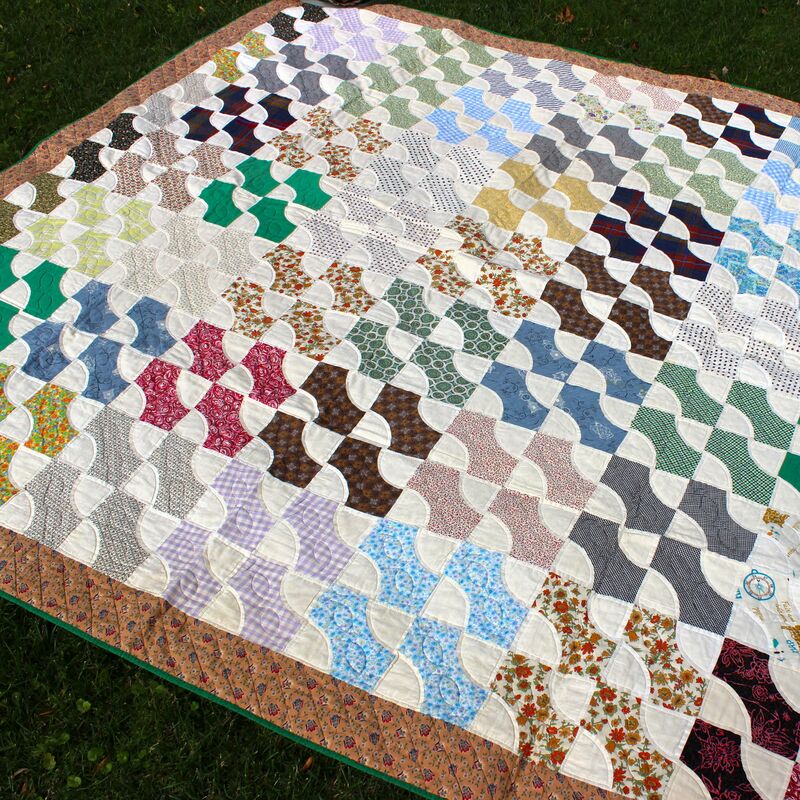 Most people view the creative aspect of quilting to be making the top—piecing the precious scraps or appliquéing the thrilling colors. It’s a lot more fun to make the tops than to do the necessary, but long and nit-picking, work of the actually quilting together of top, batting, and backing. So many more quilt tops were made than ever got turned into a finished product. But, still, an unquilted top never achieves the essence of “quiltness”—keeping a person warm while brightening a room. It’s like a caterpillar that never gets the chance to be a butterfly! You can change that! 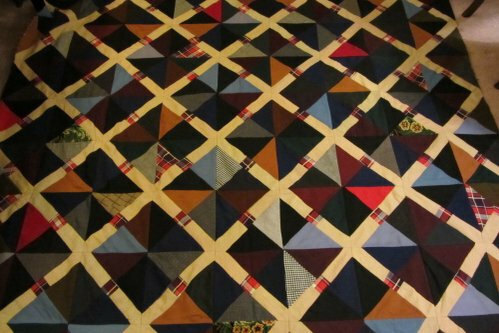 I was lucky enough to learn to quilt by hand on an unfinished top made by the venerable Grandma Van. She finished many quilts but wasn’t able to get this one done. I was learning to piece my first quilt top and was a long way from being done but wanted to try my hand at quilting. My husband had brought this quilt top home when Grandma Van died and I knew what I needed to do. It’s fun to look at this quilt now because my learning curve can be tracked from the middle of the quilt, where I started with ragged, long stitches, to the edges, where I was getting pretty good at regular, tiny stitches. It was almost like Grandma Van was there, guiding my hand! And I finished the quilt—I brought it from a pretty, but basically useless, piece of pieced fabric to the finished treasure Grandma Van meant it to be. All kinds of unfinished projects would benefit from your loving hands. The next time your fingers are itching for a new challenge, instead of starting from scratch with a new design and new materials, consider helping a “friend” finish her project. Trust me, she’ll want you to keep it when it’s done. These projects need you. You complete them. And along the way, you may just find that they complete you. Is there anything better than a farmer’s market on a perfect autumn day? Maybe the only improvement would be to visit one in a setting a little different than the ones you normally frequent, with some exotic choices mixed in with the usual favorites. We spent yesterday at Atwater Market in Montreal. 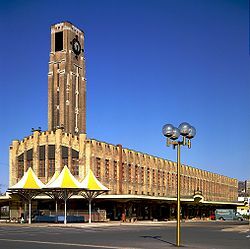 The market is set in and around an Art Deco building and opened in 1933. It has interior space with stalls that feature meats and cheeses and baked goods; during the summer, outdoor stalls overflow with beautiful produce and flowers. Shopping in a country other than your own always brings discoveries and surprises. We bought ground cherries, which we’d never heard of but are obviously related to Chinese lantern plants; these are meant to be eaten instead of displayed. We got chocolate-covered brandied cherries and chocolate gianduja bars. A cheddar made with Guinness beer, heirloom tomatoes, salt and pepper cashews, fresh croissants . . . I have two regrets. We didn’t have a car so we couldn’t really dive in. And we didn’t buy the maple and bacon-flavored potato chips. Time to start planning the next visit! My kitchen has been cold and dark. Well, actually the kitchen has been pretty lively but, as a cook, I have been cold and dark since May. My husband does nearly 100% of the cooking at our house (yes! It’s heaven!) and he has been very busy. I bake the occasional batch of cookies or loaf of bread but my main activity in our kitchen is making candy and chocolates. And I have not been able to indulge, in making or eating chocolate, since it got warm out. The reason I had to take those months off is that it is impossible to temper real chocolate if the temps are above about 70 degrees. “Tempering” is the process by which chocolate is brought to the state where it has a high gloss, stays solid at room temperature, and has that “snap” when you break it or bite into it. If a person wants to work with chocolate in warm weather, they either a) have a climate-controlled workspace or b) use a substitute for real chocolate, like the so-called “candy melts” or chocolate chips. Candy melts and chocolate chips have their place in the world but they simply are not real, quality chocolate. And since, for me, chocolate is a treat (and a high-calorie one), if I’m going to eat it, or give it to my family, or sell it to valued customers, I’m going to use the real thing. So, anyway, it’s cool now in upstate New York, so I’ve gotten back to this particular creative outlet. I’ve been re-listing candy in my shop. I guess I sell about 25 varieties and have been slowly getting them all back out there. In the last few days I’ve made a couple different concoctions. 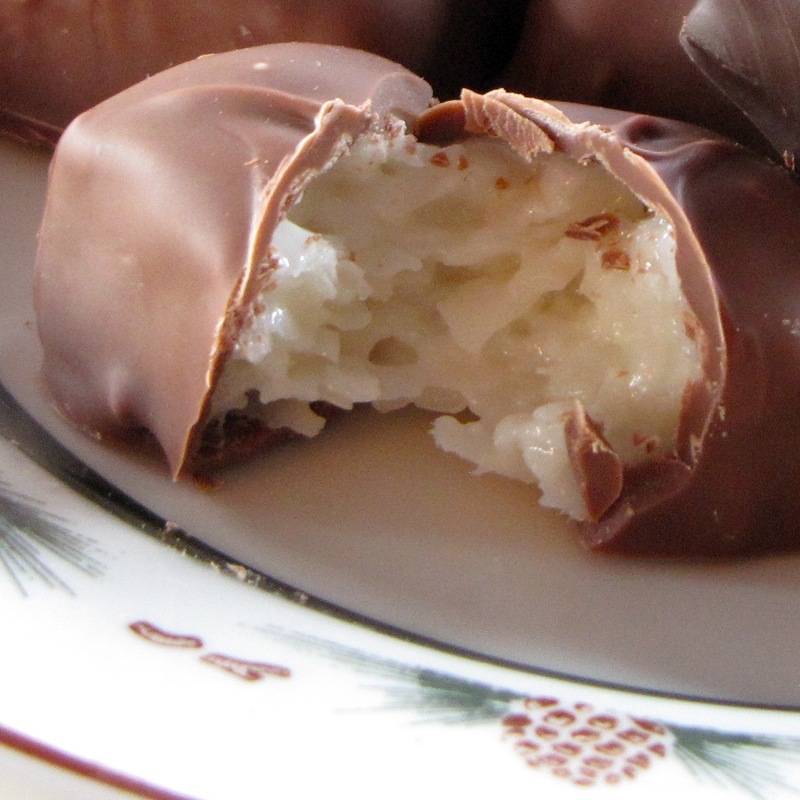 First, I made a dipped candy that is similar to Mounds bars, but a little more robust and chewier. It has a center of coconut mixed with a cooked candy syrup that is then dipped into tempered chocolate. 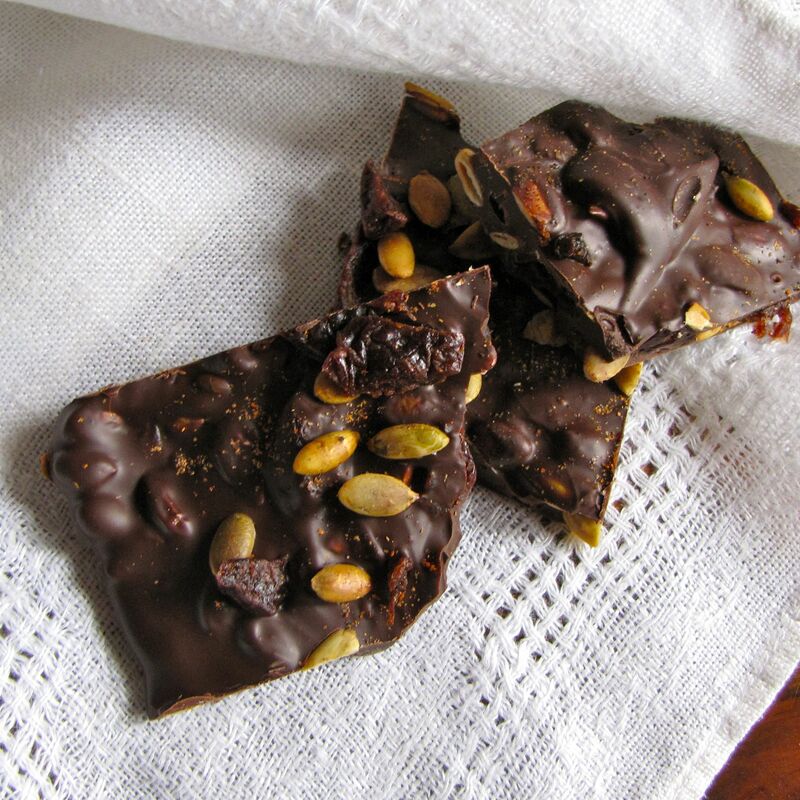 I also made a couple of batches of a spicy bark—dark chocolate, with toasted pumpkin seeds and dried sour cherries in it. It is souped up with cinnamon and some hotter spices, for a warm glow when you eat it. I made two batches because it is my mother’s very favorite and, since I was making it for a customer, I thought I better give my mom her fix, too! 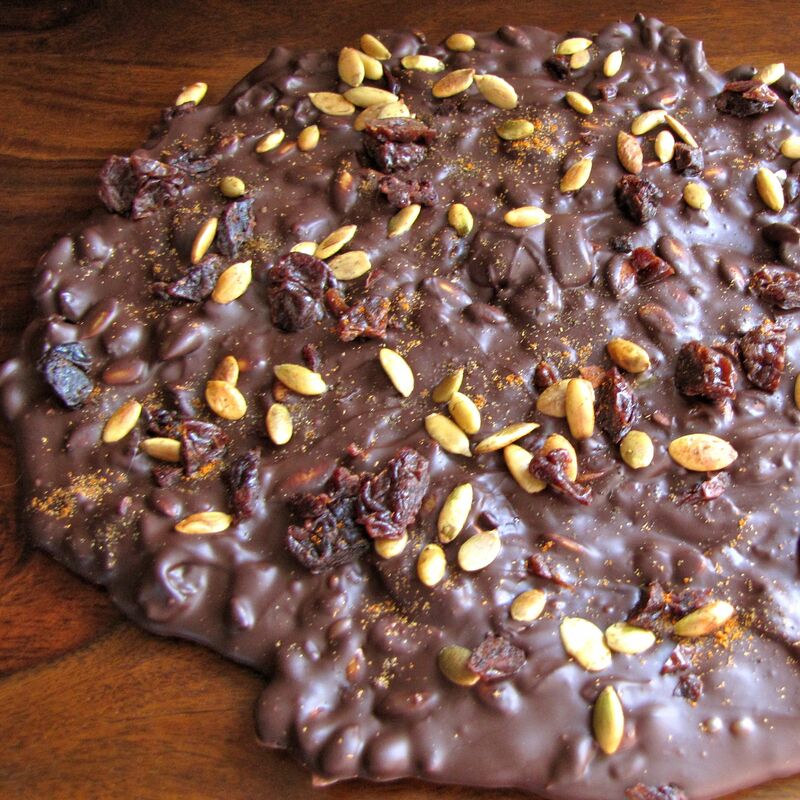 The traditional way to make bark is to get the chocolate in temper, add the inclusions and then spread the mix, free form, on parchment paper. Then when the chocolate has set, you cut it or break it apart. 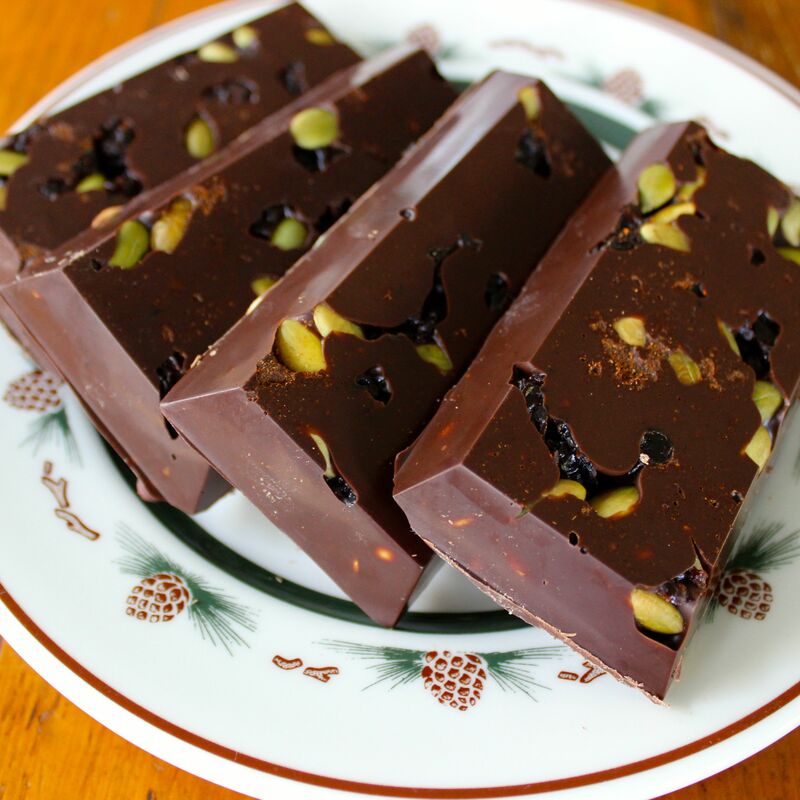 When I made this bark yesterday, I did most of it that way but then made some into candy bars, using molds. I like the way they look (see that nice shine? The chocolate was in perfect temper!) but you can’t just break a little bite off, for a nibble, like you can with the traditional bark. What do you think? Is one form more appealing than the other? I’m sure I’ll be back here, talking about chocolate as the months go by. I may even write up a lesson on how to temper chocolate, so you can make some of my goodies for yourself! For the past month, I’ve been examining and trying to articulate the reasons why many people love vintage. The first reason I discussed was the fashion appeal of vintage design; the second was a sense of ethics and commitment to re-use; the third was the related issues of cost and quality. Most recently I wrote about the sentimental and nostalgic reasons people choose vintage. I’m going to quote one of my readers to sum up the final reason for choosing to incorporate vintage into our lives; as she put it, she likes vintage items because they are “unique and uncommon.” Yes! Exactly! Let’s face it—we live in a world that has been Target-ed and Ikea-ed. Nothing wrong with those stores—they’re stylish, fun, and inexpensive. But the things one can buy there are not individualistic, uncommon, and unique. If you like stylish, fun, and inexpensive, PLUS individualistic, uncommon, and unique, I bet you love vintage! If we’re trying to better understand what draws people to choosing vintage over new, I think it would hard to over-estimate this desire to express oneself with the unusual, one of a kind, quirky, special. Vintage is all your own. You’re very unlikely to find exactly what others have, even if you go looking. Even items that were mass-produced 50 years ago are not likely to be plentiful now. 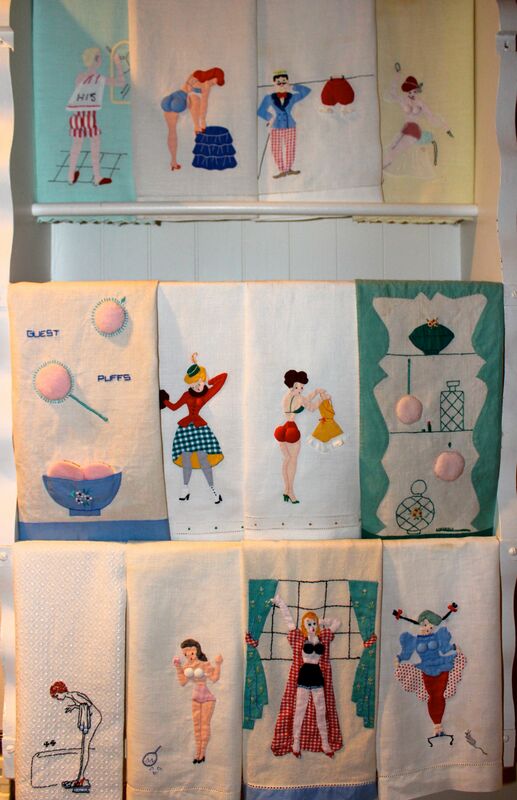 For instance, I sell vintage linens. 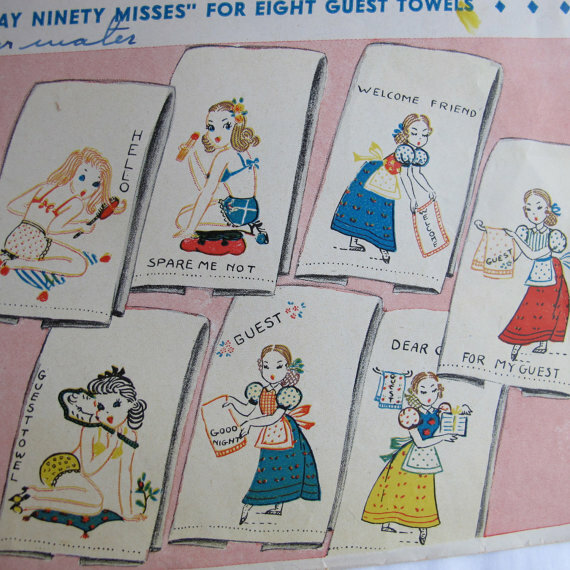 I have reference books about these items that show pictures of hundreds of examples of kitchen towels and tablecloths but most of the items that I have found and kept (or sold) do not appear in these books—there were just so many out there over the years that what you can find now seems endlessly varied! Pretty much any style, or amalgam of styles, can be expressed with vintage. 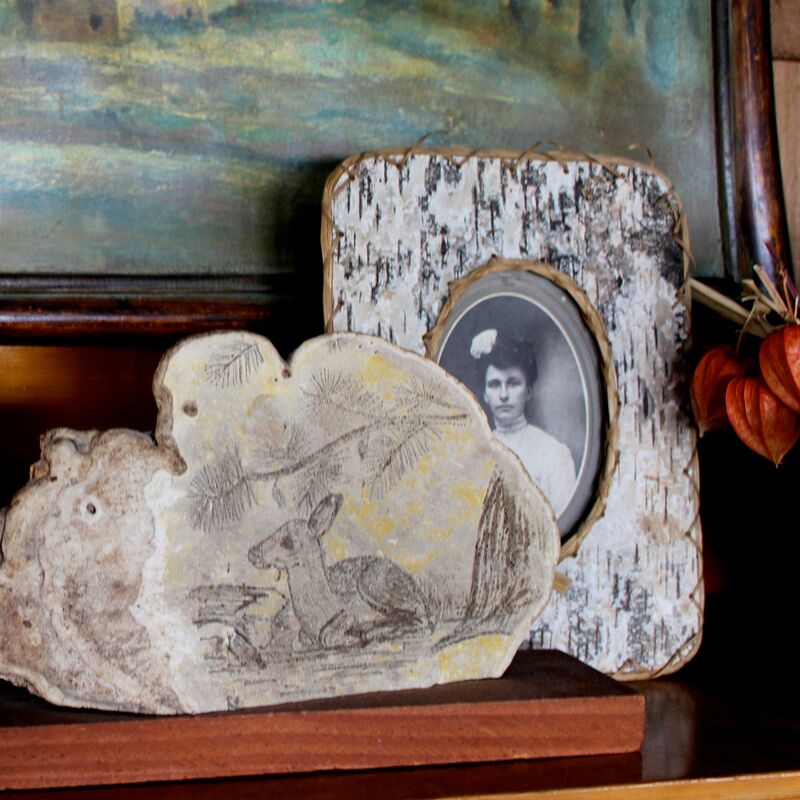 I know I like the classics and I like quirky—and my home is full of vintage purchases that express this. I’ve never been a frilly person. I’ve never been too interested in trends. I like timeless and I don’t care about matchy-matchy. I am hard pressed to find what really says “me” in stores. But by going vintage, I can get the balance I like. 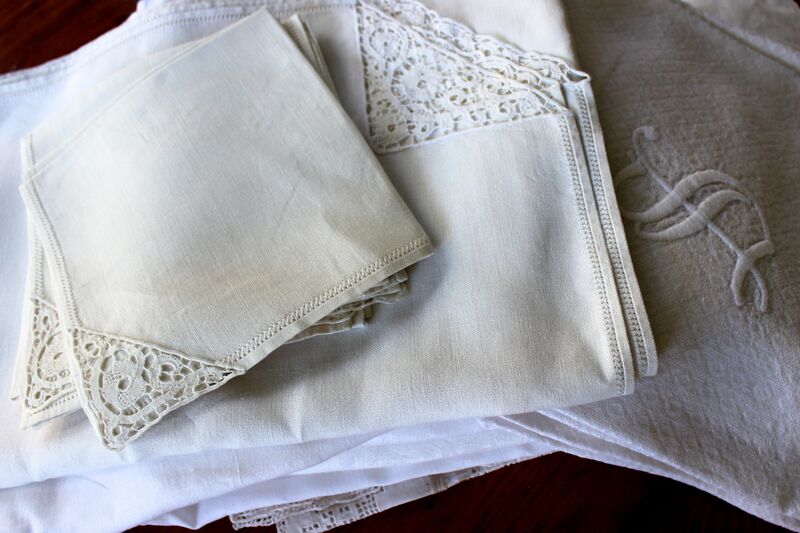 When I shop vintage, I am regularly drawn to quality white linen tablecloths and napkins. They’re elegant, without appearing to try too hard, and they can be pressed into service all around my house. I also am drawn to metals in classic styles. I have about 50 silver-plated Revere bowls, all sizes, all from garage sales (except the one I won as 3rd runner up in the Junior Miss pageant 1000 years ago)! They make quite a statement all displayed together. 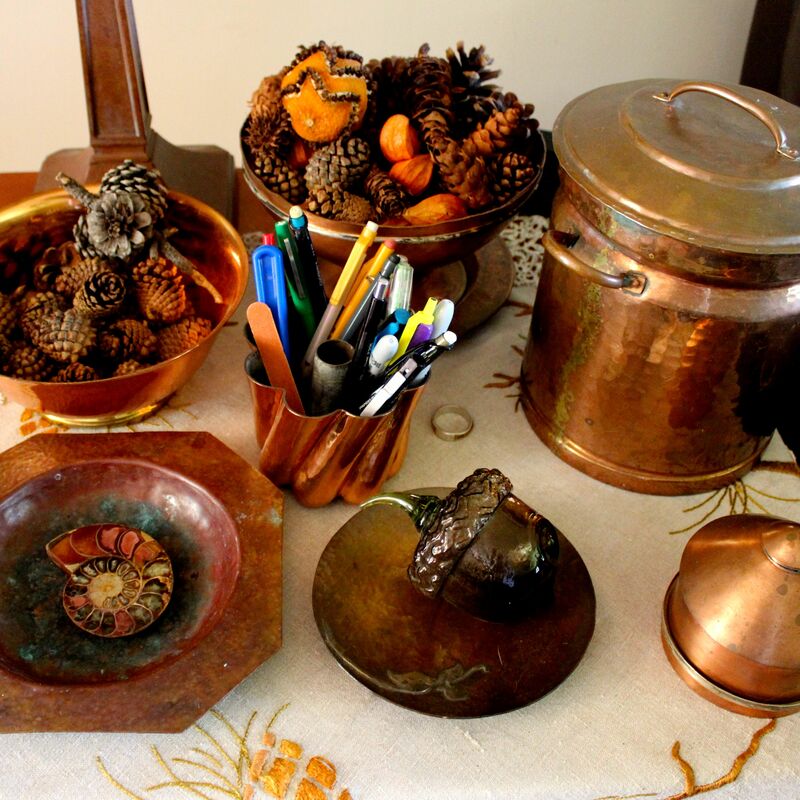 Similarly, I snap up simple copper pieces when I see them. I like the tarnish and the dings, the patina that develops over time. I like furniture that had clean lines, is casual and slightly rustic, with being too chippy and beat up. And I like it authentic; again, a patina that has come from use and love, not from a process applied at a factory. Shopping vintage lets me find the balance that says “me,” by cherry-picking a lot of looks and styles from across the years. And it lets you do the same, to meet and express your tastes. I’ve also learned, by paying attention to what I keep around, that I like the quirky, the slightly off-balanced. I want to leaven the classic and timeless with the off-beat, a tiny bit of weird. 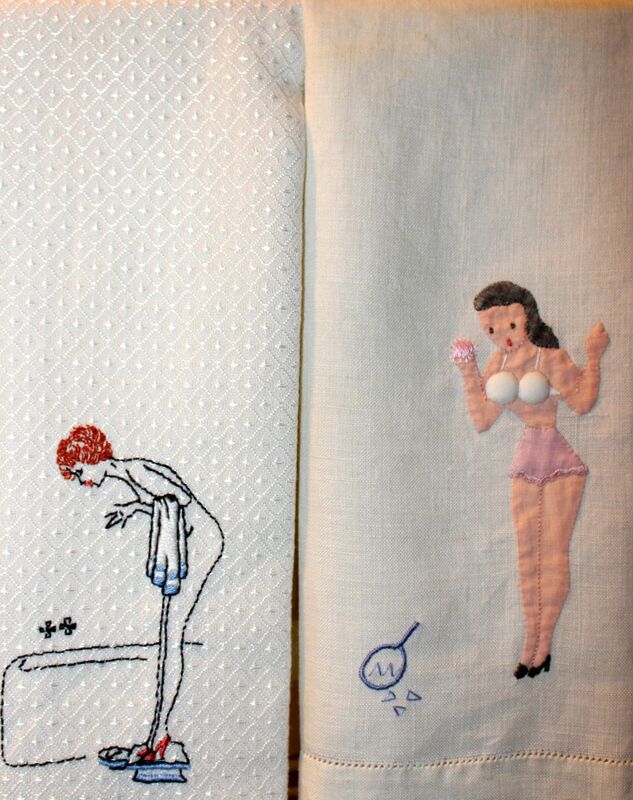 I’ve collected these towels over the years—they’re always referred to as “risqué” in listings on Etsy or eBay, even though they’re pretty tame. They make me smile every time I’m in the room where they’re displayed and I’m not ever going to see this collection in someone else’s house. Since we live in a rural setting, I also like a touch of “Adirondack” without going completely native. So, if I see an oddball planter or piece of fungus art, I can indulge myself. Really, you’re not going to find fungus art at Pottery Barn! But that’s just me! I’m not you and, if you love vintage, you already know that it allows you to express your preferences just as specifically as I can express mine! And that’s part of the appeal. Those of us who love vintage see it, partly, as a means to express a sense of self in a highly individual way. In the past few weeks, I’ve talked about the reasons why I think people are drawn to vintage items. It’s a complex mix, with a number of ingredients. Each person who chooses vintage has a different recipe for their mix: 2 parts individuality to 1 part ethics to 1 part sentiment; 2 parts trendiness to 2 parts commitment to re-use. Only we know, for ourselves, what mix motivates each of us. I’ve found it interesting, and informative, in terms of self-knowledge, to articulate these reasons. I think, for me, it’s 3 parts sentiment to one part frugality, with a soupcon of individuality thrown in for good measure. What about you? What’s your recipe for vintage love? Is it a choice motivated by 1) a sense of fashion; 2) a sense of ethics; 3) a sense of finances and quality; 4) a sense of nostalgia and sentiment; or 5) a sense of individuality? Or all of the above?! Do tell!